There are different kinds of gates you can install on your property such as swing gates or electric sliding gates. The type of gate you decide to install really depends on the application and layout of the property. Electric sliding gates are equipped with automatic locks which enhance their security. It also eliminates the need for you to step out of the car to open and close the gates, thereby reducing the risk of various dangers such as theft of your car, your belongings, etc. Usually, sliding gates have a single structure, which also makes them resistant to being driven into. Automatic sliding gates are extremely convenient and allow you to enter your home without getting out to open the gates every time. This is especially beneficial if the weather is cold, it’s raining or you’re returning home very late at night. You don’t have to get out of your vehicle to open and close the gates every time. And, once you enter your property, your gates will close automatically, without you having to rush to do it. Installing automated sliding gates ensures that you no longer have to worry about the capacity of the parking area or the landscaping, as they do not occupy a lot of space – although, they do require enough space to open. Sliding gates can fit easily in places where swing gates cannot fit comfortably. Also, since they slide instead of swinging outside or inside, the area around is not affected. You can also make use of the area next to the sliding gate, as the gate will not occupy any space when opening and closing. Sliding gates are ideal in both commercial and domestic properties. For advice from one of our experts, please phone 01329 241 740. Automated sliding gates are very functional and they are better suited for properties that have wide openings such as commercial industrial properties. An automated sliding gate is extremely beneficial, especially if your driveway has a steep upward slope, which does not allow a swing gate to be opened up the drive. Automatic sliding gates can be customized as per your property and your requirements. 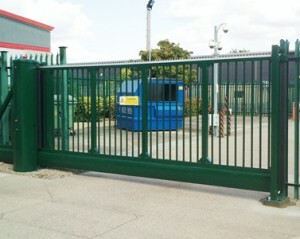 You can decide on the size of the gate, the material, features, the drive and the safety features of the gate. Automated sliding gates are also a great way to enhance the aesthetic appeal of your property and make it more attractive. Having an automated sliding gate helps to boost the market value of your property and also increases its sale value, in case you plan to sell it in the future. Installing automatic sliding gates for your home or business property is a great idea as it not only increases the security of your property but its aesthetic appeal as well! At Servian we supply and install sliding gates for commercial businesses and homes in Portsmouth, Southampton and surrounding areas in Hampshire, Surrey, Dorset, Wiltshire and West Sussex. We are members of dhf and registered with Gate Safe. Automatic gates can be opened remotely adding to the convenience. For an installation quote, please call our experienced team on 01329 241 740. Fill up the form now to get a quote.